An Entrepreneur takes risks, fails moves on and keeps on trying till success is achieved. A normal person leaves hope and gives in to failures but its the will power to keep persevering and moving towards the goal which segregates them from the normal lot. They have no exceptional body features, same hands and legs, same brain but with a different mindset. Success comes to those who work hard for it rather than sit idle. There are many who work hard and want instant success. But that never happens. If things would have been so easy, almost every person would have been an entrepreneur. The path is tough and a person need to be level headed when there are repeated failures. Believe that there is light at the end of the tunnel. An Entrepreneur's life is full of incidents where things went tough but they hooked on to an idea and moved on. 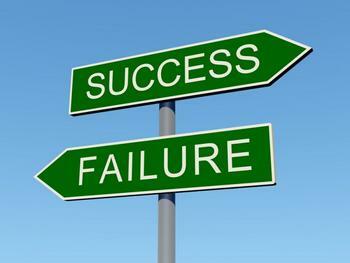 The general public sees only success and they are not aware of the failures, because the media hypes only success news. According to Kiran Majumdar Shaw, Chief, Biocon – “People don't see the failures i have gone through, they only see my success”. Any person who wants to become an entrepreneur must be prepared for both success and failures so that the mind is prepared to endure the pains of failures and celebrate success.